This month I’m giving myself a refresher course on goal setting strategies. Seems like January is a good time to do it, with the start of the New Year. But any time is a great time for me to remind myself that I can’t just think about setting goals – I also need to make a plan for achieving them. How easy it is to forget this, and to fall into old habits of wishful thinking – that somehow, just thinking about a goal will bring it to life, or hoping that things in my life will change without really taking any real action steps to achieve those changes. Years ago, one of my mentors shared a quote on goal setting and achievement from Paul J. Meyer, who is one of the “grandfathers” of today’s success and motivation leaders like Brian Tracy, John Maxwell, Tony Robbins, etc. 1. It’s not enough to want something to happen. You have to be capable of making it happen. 2. Being capable of making it happen is more than just having the skills and abilities to achieve something. It is also about having the will to do it, and being willing to pay the price to achieve it. I’d like to think that I am capable of doing anything I could ever dream of doing or achieving. I know that if I don’t have the skills or abilities to do it, I could find a way to learn them or find someone who could help me. But the larger questions are: Do I have the will to achieve this dream? And am I willing to pay the price to achieve it? Until I can answer “Yes” to these questions, then it’s just a dream or wish – not a goal. Specific – A specific goal has a better chance of being achieved than one that is general. We can get more specific when we ask ourselves: Who, What, Where, When, Which, and Why? To me, the Why is key, because it gives me the reason and motivation for accomplishing my goal. Measurable – We must find a way to track or measure our progress toward achieving the goal. The big question to ask yourself is: how will I know when it is accomplished? Attainable – I’ve found that the moment I identify a goal I really want to achieve, I begin to think of ways to do accomplish it. And if I don’t have all the abilities or skills I need to reach it, I start to think of ways to get them. I believe we can attain just about any goal we set when we plan our work and begin to work our plan. Realistic – To be realistic, a goal must be something we have the will to do, and the commitment to pay the price. Your goal is probably realistic if you believe it can be accomplished. This belief can be based on your past experience and abilities, or your estimation of favorable conditions in the future. Tangible – Your goal is tangible if you can experience it with one of your senses: taste, touch, smell, sight, or hearing. 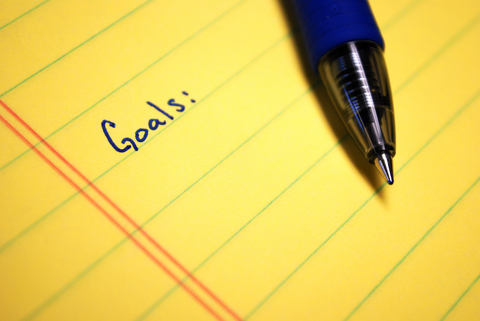 Tangible goals have a better chance of being specific, measurable and attainable. If you have an intangible goal (like a habit or attitude you want to develop), you’ll need to find tangible ways of measuring it (identify certain actions that should result if you reach that intangible goal). I’ve been frustrated that I’ve not made the progress I wanted to make on a couple of goals that I want to achieve. So, as Paul J. Meyer suggests, I’ll set aside some time over the next few days to clearly define my goals the “SMART goals” way. What about you? Are you frustrated about any goals you haven’t achieved yet? Do you think the SMART goals format will help you with setting goals and achieving them?